Cannon Beach, Oregon was an unforgettable romantic getaway, and an unbelievable part of our Pacific Northwest trip this summer. On our trip to the Northwest Pacific this summer, we made a 4-day stop at Cannon Beach, Oregon. We’ve never seen such epic views of seascapes and shore life packed into one coast. It was a romantic getaway for true adventurers that enjoy a bit of leisure too! So, sit back, relax, and enjoy the adventure with us. We’ve got lots of photos, and we also made a Cannon Beach ID Guide graphic so you can quickly identify your tide pool & beach finds! 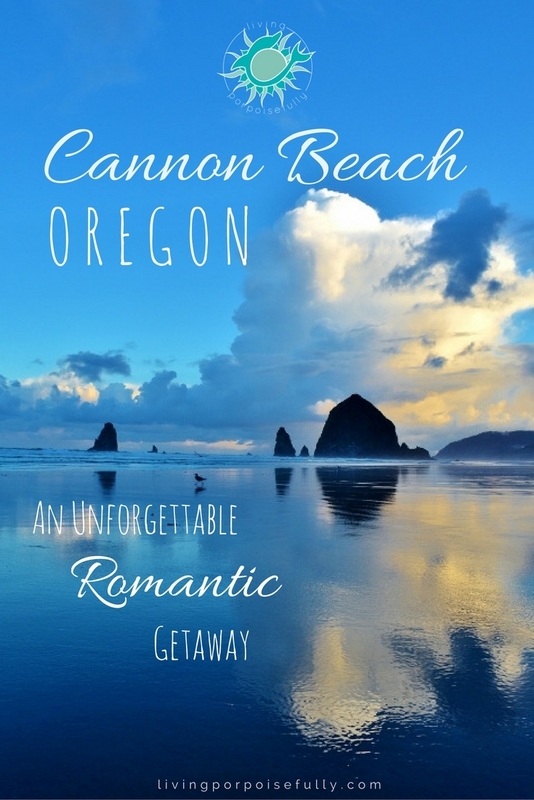 One of the most alluring parts about Cannon Beach was that the views were always different! Each time of day had its own unique colors, clouds, and seas — and somehow, each combination never looked exactly the same. It even inspired our recent “Radiate” post! One day was cloudy with passing rain showers, and the wind and waves brought in a littering of by-the-wind sailors. Each of these sailing disks is actually a colony of creatures related to jellyfish! Don’t worry, though — their stinging cells aren’t potent enough to harm humans (but may cause itching if handled, so leave them be!). The passing showers didn’t prevent us or these exuberant children from having fun! Tip: We highly recommend bringing a waterproof windbreaker — showers can come and go, and the jacket will be your saving grace to making it a fun dance in the rain! Each day during low tide, we took the short walk from our hotel to Haystack Rock to peer into tide pools with complete abandon! Low tide is the best time to go, and we were sure to check the local tide times to be there to catch the best time. We were rewarded with treasure after treasure, from giant green sea anemones to ochre sea stars. We’ve made a tide pool ID guide with the shore life treasures we saw, so you can ID your own or simply see what’s there! Of course there are many more discoveries to be found, and this city of Cannon Beach website is full of all sorts of fantastic facts about the animals found on Cannon Beach and Haystack Rock. Looking skyward on the shore, we felt like we were watching a BBC special on aerial battles between birds of prey. It was an epic scene, with three different eagles targeting the chicks of the nesting birds on Haystack Rock. It stirred up quite a raucous! Two of the three eagles made it out with a chick, with the gulls fiercely protesting. We stared up in awe at the circle of life happening before our eyes! Stephanie Inn became our haven when we weren’t tide pooling, at the beach, or out and about. It blew us away in their every detail: cozy blankets to snuggle in out on our deck, a fireplace, incredible menu, hot coffee & tea, and all the luxuries you can imagine to make it a romantic getaway. Their staff made us feel so at home, that we didn’t want to leave! Cannon Beach was such a different experience for us, growing up in the tropical latitudes of South Florida. The climate at Cannon Beach was a welcome reprieve from the heat, and our beach wardrobe was unlike what we’re used to: instead of bathing suits, we donned jeans and a windbreaker. And we also discovered that after awhile of walking in bare feet on the sand, it got quite chilly! Another stark contrast? The incredible amount of life to be discovered in the tide pools, sky, and sand. While we always look for shells on the sandy Southern beaches we’re accustomed to, we felt beyond rich as we discovered sand dollar after sand dollar and were knee deep in the treasures of Cannon Beach! Loved this entry! This is being sdded to my bucket list.How i love to travel the USA.So glad you had a great time. Amazing review! We visited for just a few hours and missed the tidal pools. Looks like I need to add it back to my travel wish list 😊. LOVEEEEE your tidal pool field guide! Absolutely!!! The tidal pools really add to the adventure! So glad you love the field guide and thank you for sharing! I want to go there! Sounds awesome! Thank you for sharing. Such a fantastic, informative, and well-written post! Thanks for sharing! I’ve always been captivated by Oregon – the scenery and wildlife are breath-taking. I currently live in Sweden. However, without a doubt, I plan on seriously exploring this state when I move back to North America. Going to Cannon Beach will be a must. Thank you so much for your comment! We had an amazing time and hope you get to experience it for yourself when you return to North America. Enjoy Sweden while you can – we hope to someday visit there too!